What Makes A Perfect Holiday Cottage For Couples Staying In Cornwall? If you're a couple looking to book a cottage in Cornwall for a special weekend away, romantic break or holiday, you want to feel confident it will meet all your expectations, cater for all your needs, and leave you time to enjoy many magical moments - free from any mishaps, misunderstandings or bad experiences - just many happy holiday memories. - so that you can relax, unwind, and enjoy some well earned peace and quiet, away from the hustle and bustle of everyday life, - in your very own perfect romantic retreat or hideaway for two (away from family, friends, neighbours and children)! 1) Choose a cottage which is totally detached - ideally not adjoining any other cottage, independant - not part of any holiday complex, and totally private - and not with any shared facilities - or overlooked. 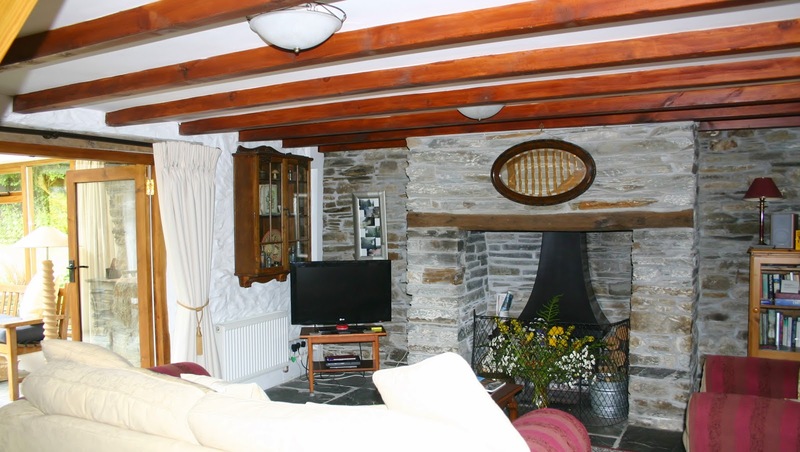 2) Look for a cosy cottage with lots character and original features - exposed beams and a log fire are fantastic- (as well as central heating) - providing a really romantic setting! 3) Check the cottage kitchen is well equipped, - to ensure any cooking you do is enjoyable, and doesn't leave you wishing you'd packed your own kitchen gadgets - and essentials. 4) Select a cottage with one good size bedroom and kingsize bed, preferably ensuite, - rather than a cottage with multiple bedrooms, where you may feel lost 'rattling around' in extra rooms you won't use. 5) Look for a cottage offering both a shower and separate bath - as it's lovely to have a shower, but truly indulgent to take time out for abit of pampering after a long soak in a deep, hot bath - with, or without your partner! 6) Check to see if the cottage offers unlimited hot water, also that you have full control of the central heating - as both are preferable - and can make a hugh difference to how much you enjoy your overall holiday cottage experience. 7) Without getting too basic, even though there's only two of you, choose a cottage with more than one toilet - 'his' and 'hers' loo! 8) Choose a cottage with some outdoor space to enjoy - such as a private, secluded garden and/or patio which is not overlooked by neighbours, and offers somewhere comfortable to relax outside (in either shade or sun). Somewhere you can read or listen to music with a favourite tipple (- after all you are on holiday!) - or just somewhere to enjoy a leisurely stroll, and stretch your legs, before retreating back inside. 9) Check there's good mobile phone signal and WiFi connection - not that you want to be constantly checking your emails, but may wish to stay in touch, - managing who can contact you - and choosing who will simply have to wait until your holiday is over! My Motto is always; 'Have it and not need it, rather than the other way round'. And then there's the cottage location to consider! Is the cottage easy to get to? (travel times and accessibility both into Cornwall, and in and around Cornwall may affect what you do on holiday). More often than not, if you're looking for a romantic break or holiday, you may be better to choose a cottage that is in a quieter location - not remote, but well placed to be able to easily 'get out and about' discovering local pubs, beaches, walks, farmshops, museums, art galleries. Whilst this will mean you need a car, (check the cottage has parking), it will give you total flexibility and independance to truly make the most of all the wonderful things, places and people here in Cornwall - and a wonderful time!